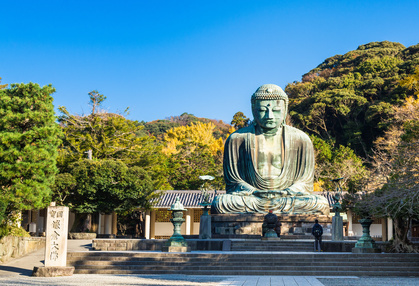 When you first hear the word “Daibutsu”, which is a great statue of Buddha, many people have the image of the Great Daibutsu in Nara or Kamakura. 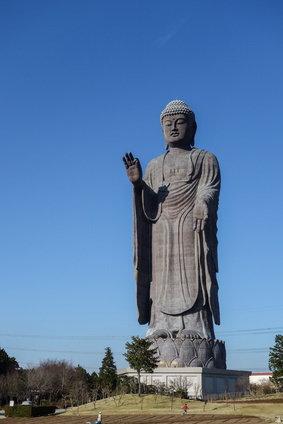 However, there is a much bigger Daibutsu in the city of Ushiku, in Ibaraki Prefecture. Ushiku Daibutsu is famous for its size, which gives a spectacular impact on everyone who sees it. So what is so spectacular about Ushiku Daibutsu other than its size? We’ll like to introduce you all about it. About a 1 hour trip from Tokyo by car, you can see the huge figure of the Ushiku Daibutsu from the Metropolitan Inter-City Expressway. Everyone who sees it for his or her first time is awed by its size. The total length is 120m including the pedestal which the Daibutsu sits upon (The pedestal is 20m, the Daibutsu is 100m) !! The Daibutsu in Nara is 14.9m tall, and it can sit on top of Ushiku Daibutsu’s hand. The height is 3 times taller than the Statue of Liberty in New York. This huge Daibutsu in Ushiku ranks 3rd place in its height, and it is the world’s largest statue made in bronze. Just like its whole size is big, each part is big as well. 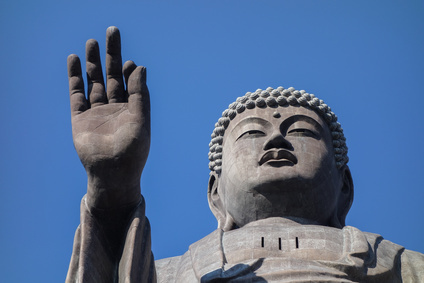 The palm of its left hand is 18m, and each spiral of the Daibutsu’s hair is 1m in diameter, each weighing 200kg. Everyone is overwhelmed by its powerful aura it holds. Ushiku Daibutsu was completed in year 1992 by the Motoyama Higashi Motoyama Dera, a temple belonging to Jodo-shin sect of Buddhism. Motoyama temple is the implementing body of the daibutsu. The daibutsu sits in a beautiful garden which shows different sceneries in each season. There is also a zoo where you can touch and feed the rabbits and squirrels, and restaurants, so many people including foreigners and people with small children are able to enjoy even if they are not Buddhists. The surprising point of Ushiku Daibutsu is not only its size, but you are able to go inside the Daibutsu’s body. There are five floors inside the Daibutsu, and each floor has a theme. For example the first floor is called “The world of the light” and as you enter darkness surrounds you which expresses the carnal desires in Buddhism. As you walk towards the door and open it, a single path of light welcomes you, as if the golden statue of Amida Butsu is leading you the way. Along the way, you are welcomed by many different kinds of lights. The second floor is “The World of Prayers and Acknowledgement”. There you can experience a sermon and to make a handwritten copy of a sutra for 15 minutes. Also you are introduced to how the Daibutsu was made and see the miniature model of the Daibutsu. The third floor is “The World of Rengezo”, which is a floor full of small Buddhist image in gold. Total of 3400 golden statues are surely going to make you surprised. Sutra chanting is done during the morning time and evening, and the solemn atmosphere spreads through the floor. On the fourth and fifth floor there is “The Room of Ryoujusen” and an observation platform. In the Room of Ryoujusen, Buddha’s ashes which is called “Busshari” is enshrined. The observation platform is 85 meters above the ground. You cannot go outside but there is a window which is placed right about the chest of the Daibutsu, and you can enjoy the view from there. Although it depends on the weather, you can see the Skytree in Tokyo and also Mt.Fuji. Isn’t that amazing? The garden is always filled with various flowers and greens, and you can enjoy the different scenery in each season. It is very nice to have a picnic there when it is sunny and warm. In May the poppy and gypsophila blooms nicely. Also in June the garden is filled with hydrangea, which shows a magnificent picture. From December 31st and during the New Year celebration, the garden is lighted up and you can see fireworks, and in August there is a festival called “Mantoue” which many lanterns are hanged to light up the garden. Also during the time of “Obon” the lantern season, the Daibutsu is lighted up by fireworks and red and blue razor beams, which is a pretty awesome sight! So, how do you think about Ushiku Daibutsu? It’s not only the size, but you have to see it for real to know the real magnificence. Why not take a trip to see the largest Daibutsu in Japan?